Popular canvas duffle made from rugged 20 ounce cotton canvas. Perfect combination of durability and classic style. Weathered for softness without losing its structure. Soft adjustable cotton webbing straps and grab handle. 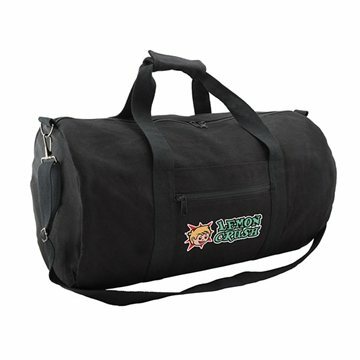 Wide center opening, large main compartment, zippered side pocket for books or travel documents. he product was well constructed and served our needs as desired. Thank you! I have no complaints about the product at all. Everything was great! Got my order super quick and was just as I wanted! Thank you! The service I received with AnyPromo is exactly what customer support should be like. I am completely pleased with my whole order experiece. Well-made...The colors I selected were perfect for both men and women.